You Deserve Respect and Justice. We Demand it ! I have been a solicitor working in the area of Personal Injury Law for over 30 years. During that time, I have seen many changes in the way the injured person has been treated. I qualified as a Solicitor in 1980. At that time, cases were heard before a Judge and Jury. Following strong lobbying from the Insurance Industry, Juries in personal injury cases were abolished. The Insurance Industry lobbyists thought that with cases being heard by Judges alone, that awards would be reduced. This in turn would help to boost the vast profits in the industry. I remember going before the Courts when the Michaelmas term commenced, fearing that my clients would suffer loss as a result of the interference in the Court System by such a strong lobby. As it turned out, Mr Justice Hamilton, in the High Court in Dublin sat on the first few cases and in fact doubled the awards that had been heretofore been awarded. A 12 month whiplash injury which up until then we could expect the sum of 15,000 Irish Punts, he awarded 30,000 ! Other Judges followed his lead. The Courts decided that in fact, Juries were not particularly generous and that awards needed to be raised in order for the injured parties to receive the appropriate compensation for their injuries. Let us jump ahead in time to the introduction by the Irish Government of the Personal Injuries Assessment Board. This State Board would in fact replace the Courts. They would decide on what was fit and proper compensation. As the Large Insurance Companies had the ear of the Government Ministers, they felt that the Judges could not be trusted. This Scheme was introduced as a ‘Lawyer Free Zone’. They were taking the whole Personal Injury area from the hands of what they termed the ‘greedy lawyers’. Thankfully, following a successful challenge in the Courts, they had to relinquish on this point. Nonetheless, it is mandatory to press all cases into PIAB. You then wait for many months until your case is decided on. This is a closed Government System. It is only when an award is made, or indeed the case ‘released’ by The Injuries Board, that you are in a position to bring your case before the Courts. Back in 1980, lawyers were banned from advertising. The norm was for an injured person to present themselves at the offices of the Insurance Company they had a claim against. You literally went in the front door and took a ticket and remained in line until your number was reached. You then had to fight to have them deal with your case. Many visits later you’d most likely be worn down and take whatever they offered you, in order to bring an end to this stressful situation. In the last 1980’s, following pressure from the Restrictive Practices Commission, advertising by lawyers was permitted. Much to the disgust, I can recall, of the Law Society, who regulate the Solicitors Profession. I was one of the first solicitors to embrace this advertising, by Radio, TV, Golden Pages and other legitimate means. This resulted in injured clients calling us at Early & Baldwin. Our caseload increased. Clients no longer queued up, took a ticket and waited. We looked after them from the moment they called us. There was a seismic change in the way injured people were treated. This freedom to advertise, coupled with the compensation that Judges were awarding, ensured that people were justly rewarded. Needless to say, the Insurance Industry were not happy with developments. There followed a new Act to curb advertising by solicitors. No longer could you promote yourself as a personal injury lawyer nor indeed ‘encourage’ people to pursue their claims. This would be deemed an offence which the solicitor would find himself/herself in deep water with the Law Society. So today, we have restrictions on advertising by Personal Injury Solicitors, coupled with a State body, The Injuries Board deciding on awards. Now, the Insurance Industry are happy. You’d never know it of course, as they conceal their massive profits and complain still about ‘fraudulent claims and suchlike. Let’s be clear about it. No solicitor will knowingly take on a fraudulent case. This is a criminal matter. The use of the term by the Insurance Industry is for one thing and one thing only. That is, to scare people into not pursuing their legitimate claims. 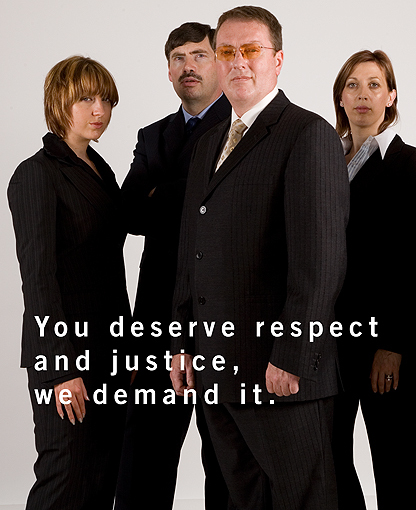 We at Early & Baldwin believe that as lawyers, we represent our clients to the best of our ability and despite the restrictions imposed at the behest of the Insurance Companies, it is our belief that our clients deserve Respect and Justice and we will continue to demand it on their behalf. While we are not alone amongst our profession in holding these views, we urge all solicitors involved in working with plaintiff claimants to demand the same for their clients. Don’t accept anything less as all our clients deserve as much.